After nearly 4 years, Denver‘s residential real estate is rapidly creating a “new normal”. Declining values, lengthy marketing times and virtually no new construction, 2012 has seen a new and exciting market emerge. As we routinely begin to experience multiple offer scenarios below $400K, we look for explanations of this dramatic change in our market dynamics. I hadn’t heard the term in at least 10 years when while discussing the Denver Market with one of my clients, velocity came up in conversation. In round numbers we’ve seen Denver Real Estate turn on a dime. From slightly more than 14,000 listings little more than a year ago to just barely over 8,000 today! All while this was happening, our transaction volume slowly crept up on us until Pow! Wam! Bam! we are actually discussing appraisal issues, and how will they keep pace with this “New Normal”? Click on the chart above, in just the first two months of the year, we’ve seen still more dramatic market changes. 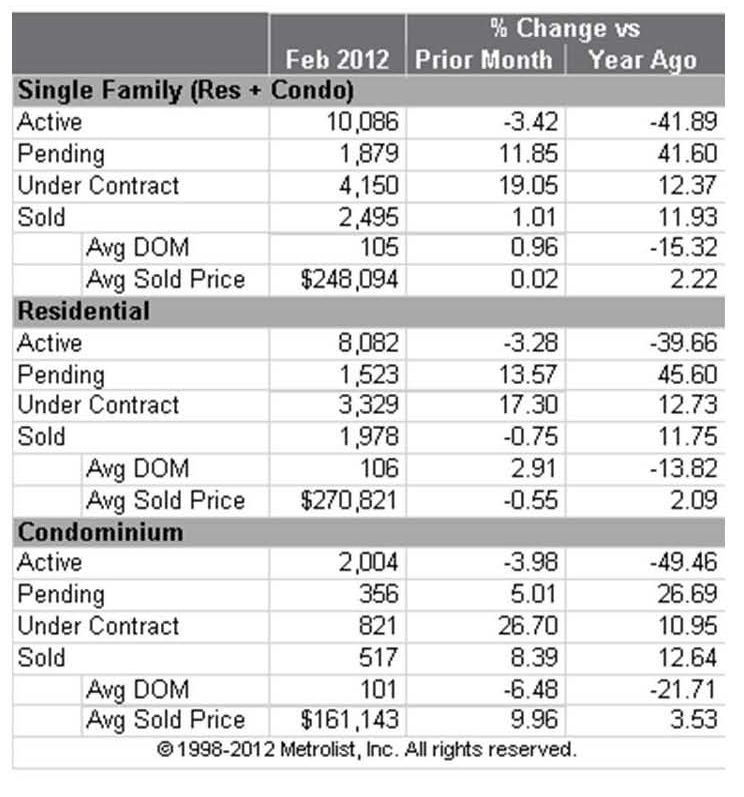 I’m telling sellers now is the time to get into the market with that long awaited move. I’m telling buyers, “you still have rates, but inventory is no longer your friend”. Enter an even newer player, New Construction! After hitting a 40 year low for residential starts during this painful time, we now see an explosion of infill, tract and even the return of the custom homes build to suit. One can’t expect the new home market to be a dramatic impact on our market over night, but with developed dirt, an eager market and some quality infill locations new home starts will be a force to be reckoned with during this time of New Normal. Next, enter the confident seller! With multiple offers on the kitchen table, those picky inspection objections from buyers are being slapped hard by this market inspired confidence. Denver Real Estate is not the perfect market, it still has some very troubled neighborhoods that were ill advised, unprotected and in some cases abandoned, but it is clearly making a serious attempt at righting the wrongs of the past. This entry was posted in 2011 YEAR END DENVER MARKET WATCH, Buying or Selling Real Estate, Centennial, Cherry Hills Village, Colorado, Denver, Denver Housing, Denver Residential Real Estate, Greenwood Village and tagged Business, Business and Economy, Days on market, Denver, Denver Real Estate, Major League Soccer, Real estate, United States. Bookmark the permalink.